Enable seamless, localized, one-click authentication, all while keeping players’ data safe and entirely under your ownership. Offer accessible, safe, quick registration and login through regional and global third-party authentication providers. Support users who prefer traditional authentication with email and password registration options. 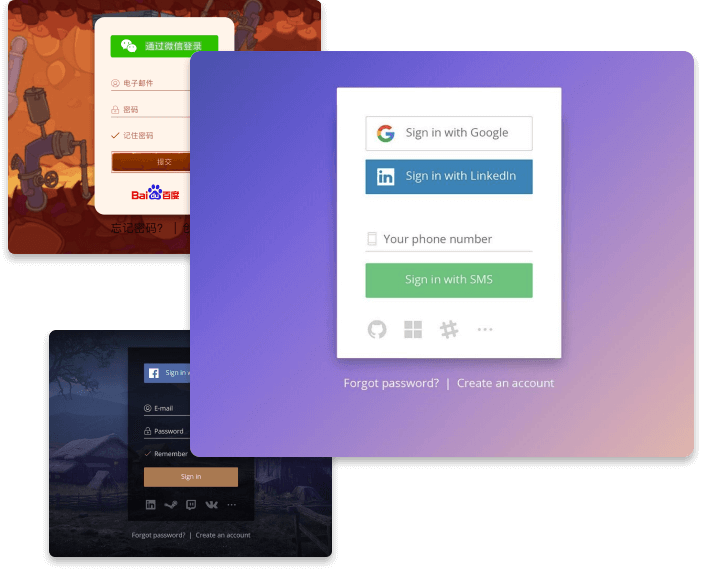 Improve login convenience with localized, prioritized authentication method display. Let players invite friends across social networks through cross-platform friends system. Manage permissions for different groups like employees, testers, influencers, media, early adopters, etc. with variable access rights. Match your brand’s style and design with white-label design customization. Deliver greater protection for your users’ identities and data with additional authentication parameters. Prevent data loss by storing duplicates of your users’ personal information at multiple secure locations. Provide users with accessible assistance for all security issues, available by phone, chat, or email. Hands-off compliance with every personal information and game access regulation around the world. Track user practices and trends with scheduled usage reports, or integrate your own analytics code to monitor performance separately. Operate with complete control of your users’ data, every step of the way. Determine who can view it, how to use it, and where it’s stored.